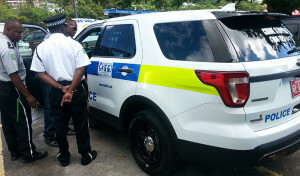 Thursday, September 24 – The two of the first built-for-purpose police vehicles ever acquired by the Royal Virgin Islands Police Force are now on the roads of Tortola, with the third one on its way. Among the special features of the new vehicles is a mobile workstation which allows officers access to the Force’s database for retrieving and importing information. With the portable data system, officers can obtain and file reports as well as record necessary intelligence while on patrol allowing officers to spend more time outside the police station and to be more visible to the public. These new vehicles are also equipped with built-in safety barriers, partitions and doors for suitable containment of prisoners. In the past, partitions were constructed and welded into ordinary vehicles for the purpose of carrying prisoners. Acting Commissioner of Police Alwin James expressed his gratitude on behalf of the organisation to Government, Ministry of Finance and the Deputy Governor’s Office for making the monies available this year for purchasing these vehicles. The Acting Commissioner also thanked Burke’s Garage who sourced and purchased the vehicles off-island and arranged for their transport to the Territory.